President Barack Obama was caught smiling and taking a selfie with his seat-mates, Denmark’s PM Helle Thorning-Schmidt and Britain’s David Cameron during Nelson Mandela’s massive memorial service in Johannesburg. As the three of them smile for the camera, a stern-looking Michelle Obama can be seen staring straight ahead, hands clasped. 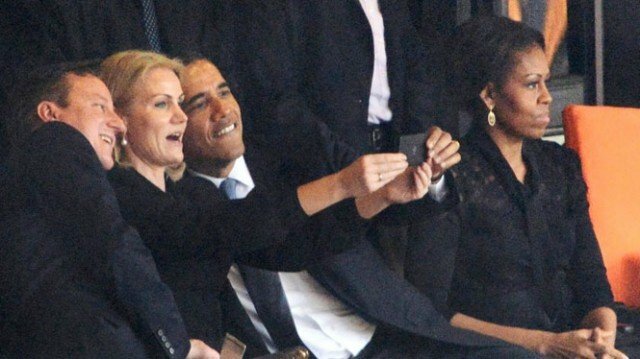 Michelle Obama’s reaction – not just to the “selfie” but to her husband’s chatting and joking with the young Danish prime minister – was priceless. In one picture, Michelle Obama could be seen glaring over at Barack Obama while he put his hand on Helle Thorning-Schmidt’s shoulder. In another, it appeared the first lady and the president switched seats, putting Michelle Obama squarely between him and Helle Thorning-Schmidt. The photographer behind the “selfie” pic of the three dignitaries, though, later claimed that the first lady herself was “joking with those around her” a few seconds earlier. “The stern look was captured by chance,” he wrote. After the images surged through social media, the White House on Wednesday released its own set of photos of Barack Obama’s South Africa visit and among them was a picture of Obama, the first lady and the Danish prime minister. But in this one, Barack Obama was talking to his wife, while Helle Thorning-Schmidt seemed preoccupied with her phone. The “selfie” incident was the second unexpected controversy stirred up by the president in South Africa. Earlier, Cuban-American lawmakers publicly objected after Barack Obama – on his way to deliver his tribute to Nelson Mandela – shook the hand of Cuba’s President Raul Castro.